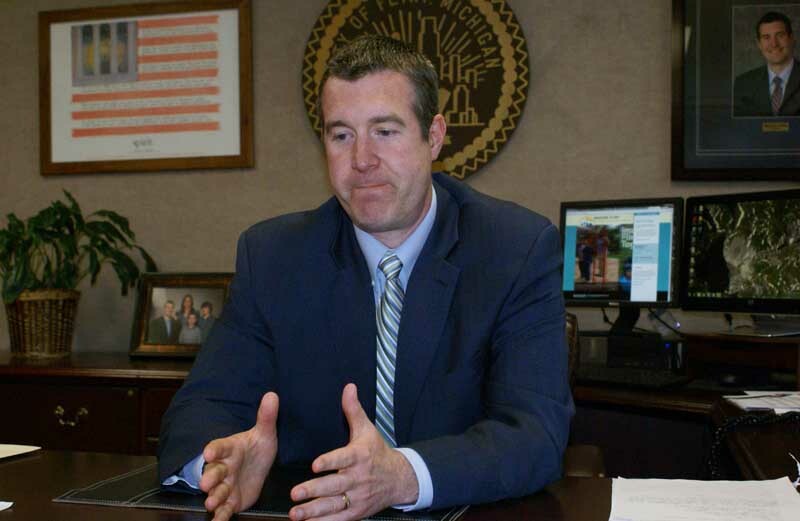 It is unfair to expect Flint's current residents to bear the full brunt of the city's legacy costs, which were incurred when the city's population was twice its current level, Mayor Dayne Walling said. When Patty Tokar’s husband, Steve, retired from Flint’s sewer department in 1996, the couple figured they wouldn’t collect a large pension, but at least they’d have generous health insurance. That was before Flint’s emergency financial manager cut health insurance coverage last year for the city’s retirees. Which is also when Patty suffered a heart attack, leaving the couple to pay $4,511 in deductibles and copayments, most of which would have been covered under her husband’s former insurance, she said. With her heart disease, diabetes and kidney failure, she’s been hospitalized repeatedly, forcing them to shell out another $4,357 so far this year for medical bills not covered by their scaled down insurance. Across town, Mark Coggins said he doesn’t think he should have to pay higher taxes so that city retirees can live more comfortably. He switched off the tractor he uses to mow lawns at thousands of abandoned homes throughout the city, a seasonal job he got after he was laid off from a factory seven years ago. In cities, villages and townships across Michigan, the same battle is brewing with municipal retirees insisting that their former employers hold to guaranteed pensions and generous health-care benefits, and taxpayers saying they shouldn’t have to pay higher taxes to keep unaffordable promises that their elected leaders made in the past. Therein is the dilemma, said Douglas Roberts, a former state treasurer and now director of Michigan State University’s Institute for Public Policy and Social Research. If Michigan’s municipalities are to survive, they must reduce their legacy costs, and soon, he said. In 2011, more than 300 Michigan cities, townships and villages faced nearly $13 billion in unfunded retiree health-care costs, and another $3 billion in pension liabilities, according to a study this year co-authored by Eric Scorsone, a Michigan State University economics professor. It’s a bill that is increasingly leaving these local governments, which represent roughly two-thirds of Michigan residents, unable to deliver basic services, such as police and fire protection. In most of these towns and cities, officials agreed to provide these so-called legacy benefits years or even decades ago, but failed to set aside enough money to keep those promises. Patty Tokar thumbs through thousands of dollars in medical bills she's received since Flint's emergency manager cut her husband's retiree insurance benefits. In Michigan communities of all sizes, administrators and elected officials are facing the same question: Should they put aside more money to fund the mounting, often unpredictable cost of retiree health care and pensions, or should they spend it to maintain public safety and repair a few more streets? According to the MSU study, every resident of Frankenmuth, a city of slightly under 5,000, would have to pay $572 to fully fund the city’s pension and retiree health-care plans. Frankenmuth’s larger neighbor, Flint, faced even more severe budget problems in 2011, including unfunded legacy costs of $1.1 billion, Scorsone found – or $10,857 for every city resident. If Flint were to pay the more than $74 million a year Scorsone estimated it should to fully fund its legacy costs, it would have nothing left for basic city services. It could not afford one tank of gas for a police cruiser, nor one dime of payroll for a single employee. To fully pay its legacy costs, Flint would need to increase its property taxes by 56.8 mills, which would come to $2,840 more each year for the owner of a home worth $100,000. Only then would the city and its residents actually be paying – rather than delaying – the full cost for city promises rendered long ago. As of 2011, that included more than $862 million in unfunded health insurance for city retirees. That shortfall dropped considerably, to just over $300 million a year ago, after an emergency financial manager appointed by Gov. Rick Snyder shifted the city’s retirees into a less-expensive – and less generous – plan, one that requires retirees to contribute far more to their own medical expenses. A series of emergency managers have struggled to right the city’s ship. Michael Brown, who served two stints as Flint’s emergency manager, resigned in September and was replaced by former Saginaw City Manager Darnell Earley. The once-prosperous industrial city, birthplace of General Motors, has been in a free fall for decades. GM, which once employed 80,000 in the city, now has about 8,000 workers in Flint, Walling said. Buick City, once among the world’s greatest industrial complexes, today is a two-mile stretch of vacant land fenced by chain link and barbed wire and littered with weeds and trash. The adjacent residential neighborhood is scarred with boarded-up houses and empty lots. About 5,000 abandoned homes need to be demolished, and another 5,000 sit vacant. Flint has topped the FBI’s list of most violent U.S. cities for four years, while nearly one in five adults remain unemployed, which is actually an improvement from 2009. Flint’s population of slightly more than 100,000 is half what it was in the 1960s, when city officials agreed to union demands for better pensions and retiree health care. Walling suggested that it is unfair to expect current residents to pay for benefits that were promised before half the population moved out. The residents who have moved since the 1960s enjoyed better police, fire and other services at the time today’s retirees were active employees, Walling said. Since many former residents now live in other Genesee County communities, they ought to help pay for Flint’s legacy costs that were incurred while they lived in the city, he said. That line of reasoning hardly sits well in the rest Genesee County. Like many other Michigan municipalities, Mt. Morris Township is wrestling with its own unfunded legacy costs, which amount to $1,370 for every resident, according to Scorsone’s study. Walling is urging state lawmakers to approve a bill that would allow Flint to raise its income tax – currently 1 percent for residents and .5 percent for nonresidents who work in the city – to 1.5 percent for residents and .75 percent for nonresidents. Another bill, if approved, would allow Flint to collect the same income tax rate of 1 percent from residents and nonresidents. Property tax, historically the main support for Michigan’s local governments, no longer is a reliable funding source, Walling said, as Flint has lost 75 percent of its property tax base in the past two decades. Walling said that if Flint eliminated its legacy costs, it could hire 80 more police officers, a couple dozen firefighters and a dozen or so youth workers for the city’s parks. The city’s current budget of $55 million is half what it was a decade ago, In recent years, the city cut its workforce from 1,200 employees to about 500 today. In retrospect, those cuts may have contributed to the city’s huge unfunded legacy costs, since fewer active employees are paying into the pension fund. Accountants call the city’s retirement system “super mature,” because it has only 500 active employees and 2,000 retirees. As a resident of Genesee County outside of Flint, Jim Wood doesn't think he should pay higher taxes to bail Flint out of its financial problems, including its unfunded legacy costs. Inside a largely abandoned shopping mall, several of those retirees gathered in the URGE office, the group formed to advocate for their rights. They have sued the city in a still-unresolved effort to save their health-care benefits. Like most of the retirees, Brian Moe accepted the city’s offer of five years’ credit toward his pension if he would take an early retirement. He understood that to include not only a pension, but a promise that his health insurance would not be cut. Instead, he’s struggling to pay thousands of dollars in medical bills after having both knees replaced. Fourteen hundred miles south, in Naples, Fla., Jerry Dylag, 71, took a part-time job as a security guard to supplement his $42,000-a-year pension and put aside some money in case the city further cuts – or eliminates – his health insurance. After directing Flint’s community centers for more than 25 years, he accepted the city’s early retirement offer in 1994. At the time, he understood his pension and health care were guaranteed. “I’m very worried about it,” Dylag said. “This didn’t seem to be the agreement I had when I left. I’m in good health now, but there’s no guarantee. There’s that fear that something could go wrong. I get concerned about the future and what the city’s going to do next." Question: why is a 70+ year retiree worried about city health insurance cutbacks? Is he not on Medicare? I don't understand his concerns. Plz explain. Thx. The city was paying for a Medicare Supplimental coverage that covers the 10% co-paythat comes with Medicare... I believe. Unless the retiree isn't 65 and then the city covered the whole thing. This is also part of the problem we've caused ourselves by not raising retirement age as life expectancy has increased, theoretically creating a class of people being supported through 20 and 30 years of non-productivity. And it's only going to get worse. Actually, Medicare only pays 80% of costs, leaving 20% unfunded. A supplemental policy for someone near age 70 is about $3,000 per year. Costs vary by age and company, but all supplemental plans, of which there are about a dozen, are the same as dictated by Medicare. Thus someone with a nondeductible plan (Plan F in Medicare parlance) has the same coverage from all the different insurance companies. Different insurance companies can charge different costs for this plan, but the coverage is the same. Then there are the Medicare Advantage plans, where Medicare pays the plan and the plan picks up the costs. These however limit you to only going to certain doctors, certain hospitals, certain drugs, etc. Medicare is complicated, and it gets more so each day with Obamacare. "unfunded legacies" - a term used to describe an entity (government, business, non-profit NGO or otherwise) which did not follow sound actuarial practices in establishing an investment portfolio of deferred compensation during an employee's working years sufficient to meet future payouts to individual employees following his/her reaching full retirement while then blaming the shortfall on factors beyond the control of the pension system managers then shorting or eliminating any previously understood "guarantees" made by the employer. Yes, unfunded legacies exist . . . but that doesn't necessarily mean that sound actuarial practices weren't followed. The sound actuarial practices of the 70's and 80's did not predict either of two factors that are dramatically increasing these legacy costs : that people are living longer in retirement and that health care costs have increased at two times the rate of inflation since 1980. I don't doubt that some communities chose not to follow good actuarial practices; I see plenty of that going on today despite knowing better now. I only say that other factors are also making the problem much worse. Lastly, don't forget that any "pay as you go" system is a Ponzi scheme of sorts, the greatest of which is Social Security. In the more optimistic 50's and 60's government at all levels thought that these systems were working well and populations would continue to rise far into the future. So meeting the standards of actuarial practice (the ones existant at that time) wasn't considered necessary for government. That was the kind of thing only done by the titans of industry, such as the steel makers, automakers, airlines, etc. In judging them harshly for failing to do so is applying today's ethics to the past. Bill, If you are concerned about judging those who agree to the programs that created such fiscal distress, do you believe poltician and government officials should be held accountable at all? When private companies were being held fiscally responsible for these funding issues, government/politicians were exampeting themselves, doesn't that seem they were consciously choosing not to follow a prudent course? It would seem that those spending other people's money are held to certain fiduciary, at least that is true of financial institutions, why should those spending taxpayers dollars be similarly held to a like expectation? It would seem that there were many indications for taking actions at least back in the 90s even the late 80s, what was the reason governments shouldn't have take the fiscally responsible actions? If we look at the data on government entities under funding, why are there those that are less than $300 per community resident, many more in thecouple of thousand dollar range, and then there is Detroit in the $11,000 why should there be some accountability base on their funding problem, some have beensuccessful? I laugh when the unions are blamed for the City of Flint's fiscal mess - back when Mr. Craft was negotiating for the city he proposed that if " you boys " would be frugal with your sick and vacation days the city would reward you when you retire - This was not an absorbent union demand but a move by the city to have less time off by it's employees, so as to not have to hire more workers to fill those days - also the city negotiated a self funded retirement and benefits program and convinced the police and fire employees to forgo paying into social security, thus saving the city large contributions once again - well that came back to bite us through federal legislation called " Pension Offset and Windfall Profit " - many of the city employees worked part time jobs and or had social security taken out in a job prior to hiring on to the city - the result of these act only allows us to draw one third of out benefits and if we die our spouses get none of our S.S. benefits and if the spouse dies the employee receives none either and if the employee works a job after retirement the government still takes two thirds of that jobs S.S. - all this we owe to the City of Flint opting out of Social Security - Oh we also do not get optical or dental coverage, so the picture painted by Mayor Walling is not historically correct - the city did not downsize as the city shrunk and also lost practically every lawsuit filed against it for unconstitutional discrimination - lawsuits cost the City of Flint approximately 17 million dollars - Gee isn't that almost the same amount of money the city is in debt ? - what a coincidence - I won't name what Mayor this occurred under - figure it out ! I know some city of Flint retirees and what seems to be forgotten is that these retirees paid in to their pension plans at a rate of 8% for long time and then reduced to 6%. That is a significant amount of money given up to the pension plan for the City to use the employees money for profit. Taxpayers, citizens all over are paying for retirees. Where do you think GM gets money for pensions, etc? You pay in the price of that vehicle you purchae. Hospitals pay for pensions in prices they charge, etc. It occurs in all parts of businesses. City of Flint retirees endured much stress on their bodies working out in the streets. To retire and being promised certain health benefits should be honored. The reality is that defined benefit plans (unlike defined contribution plans), only work if you have an increasing employee force. Otherwise, they become a Ponzi scheme. This really is the same as Social Security which started with 16 or 17 employees for each retiree. It now is less than 3 to 1. Corporate America long ago realized this and switched from defined benefit plans to defined contribution plans for its employees. Only public employers and employees failed to change, resulting in seriously underfunded public plans due to decreasing labor forces (and not funding the plans in order to pay for other needed services--resulting in 40 to 50 per cent obligations, crippling other funding needs such as police, fire, water, sewer, lighting, roads, trash, etc. In short, it cannot be sustained, and has to be renegotiated. It is not unlike what happened to Delphi workers.